These renowned pioneering recordings from the first half of the 1930s have never sounded better. Mark Obert-Thorn has lavished upon those shellac surfaces connoisseur-pleasing audio-technical TLC. As for the source material, this is down to the generosity of collectors Richard A. Kaplan, Nathan Brown and Charles Niss. 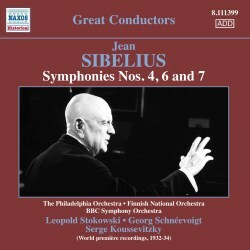 The Kajanus, Koussevitsky and Schnéevoigt material is included in the comparatively recent and appealingly priced 7-CD Sibelius box (Historical Recordings and Rarities - 1928-1948) from Warner but not the Stokowski version of the Fourth Symphony. 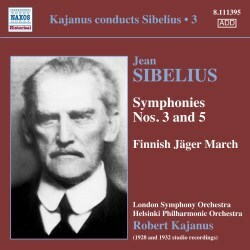 The first disc here completes Naxos' Kajanus Sibelius Society series, being the third volume in that line. The two previous volumes were addressed here and here. Kajanus (1856-1933), who was to die within the year, goads forward an extremely exciting Third Symphony. It is up there in terms of urgency and tense music-making with that of Oramo in the Sixth. This is not all about adrenaline. The Third Symphony’s green and statuesque dignity is also captured with attentive poise reflected in the handling of the woodwind writing at 5:33 in the middle movement. The whole thing has the indomitable power of a marching phalanx ... and it works. Only once does a weakening lethargy enter and that is momentarily in the finale at 5:40 where the proceedings begin to lumber for a moment. The Third Symphony is something of a Cinderella alongside the enchantingly winged Sixth; not so the Fifth. This Kajanus reading is strong on propulsive emphasis and with the tension sustained as tight as a drum. At 3.19 Sibelius looks forward to the winds of Tapiola – and does so in Kajanus’s hands in a way few have emphasised with such potency. Overall the second movement is very good and satisfying but has a looser grip than that apparent from the Kajanus Third. The second movement ends on a knife-edge fall into digital silence, which is a pity. The finale of No. 5 returns to form. Illustrations abound – try the quite supernatural and steely spectral ostinato at around 5:13. We conclude with the Finnish Jäger March. It’s ‘old pals’ oompah swing now strikes uncanny echoes with the Soviet army marches of the mid-1940s. The recording is somewhat boxy but Kajanus packs plenty of muscular chumminess. The second disc, which forms part of Naxos' Great Conductors series, fills the gaps left by Kajanus’s passing. If Kajanus omitted symphonies 4, 6 and 7 much as Karajan studiously side-stepped numbers 1 and 3, Beecham, Schnéevoigt and Koussevitsky filled the gaps, rather as Okko Kamu stepped into the breach for DG's first cycle. With one minor exception these recordings were all made during the first decade of a silence that was to continue until the composer’s death a quarter century later. Strange to think that when they were issued the musical public and profession had high hopes that there would be more symphonies to come. These three landmark premiere recordings have not appeared together before. While the Schnéevoigt 6 and Koussevitsky 7 are familiar presences, the Stokowski Fourth is much less so. It has been issued before on Biddulph but that was back in 2002. It’s a very impressive-sounding version even if it is played by a cut-down orchestra who compensate with a plenitude of pleasing new-minted detail. I ‘learnt’ the work from a DG cassette of Karajan and the BPO recorded in the 1960s. Stokowski is quite different. There is less of the gruffly impetuous in Stokowski and more of a glow – lit from within. He opts for glockenspiel and then tubular bells in the finale and this makes quite an impact when compared with the rest of the pack. The quicksilver cello solos near the finale’s start are much less rapid yet things are held together unerringly. It’s as if we are hearing the work afresh – re-imagined. Stokowski romanticises the symphony in a way that I find very satisfying. It makes for an intriguing listen, as is often the case with this conductor. The Schnéevoigt Sixth has been issued several times: by Divine Art in 2005 and by Historic Recordings in 2010. It’s good to have it again and in such intriguing company. I had cause to comment in 2010 that this performance is “quite unsentimental but Schnéevoigt’s yielding steel and athletic urgency conveys a constant and exalting sense of pressing forward.” Nothing has changed in that respect. Koussevitsky’s 'take' on the Seventh Symphony is well enough known. It's heavy-weight and radiant with concert atmosphere. That said, it lacks the studio power of the 1960s Ormandy, its concert hall ambience and ferocious energy (review review) never mind the white heat of Mravinsky. It has been issued by Naxos before and reviewed here and here. It can also be heard on this conductor’s GCOC duo. I had high hopes of Naxos's other disc of Koussevitsky in Symphonies 2 and 5 but the performances lack life and lustre. This non-Kajanus disc is generously packed at close to 80 minutes. I wonder if that is the reason why each movement makes a sharply vertiginous fall into the uncanny silence around the digital process. That’s my one criticism of this CD. Both discs (only available separately) are fascinatingly supported by a detailed liner-essay by Colin Anderson and a technical note by Mark Obert-Thorn.